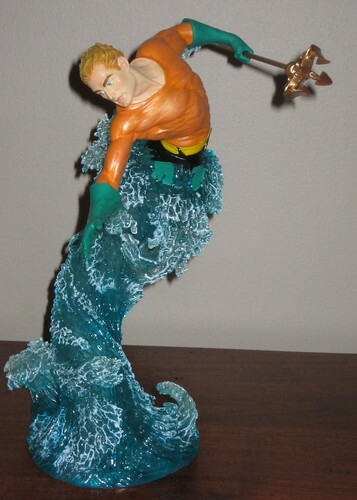 The original DC Direct Tim Bruckner Aquaman statue is one of my collecting holy grails, and I dare say will remain so, unless something dramatic happens to the secondary market prices for that great piece. While the new Bruckner-sculpted Aquaman Statue from DC Direct's DC Dynamics Statue line isn't going to fill that void, it's the first full-sized Aquaman statue in quite some time, and it's very good looking to boot. The idea of the DC Dynamics line is the visual provided by the detailed, colourful base which envelops the legs of the character. Unsurprisingly, Aquaman's base is a water spout, complete with foamy edges. It's a tall and thin statue but is remarkably stable. Quite often with DCD Statues and Busts the end product is a little bit less than the sketch or solicit photo, but this is one statue that actually looks better than the pictures - the paintwork on the detail of the face in the profile shot on the box doesn't hold a candle to the real thing - it's a much better job. The styling choice for Aquaman is very classic - interestingly no scales on the orange of his shirt. The sculpting here is quite beautiful, with wrinkles that match the twist in his torso. 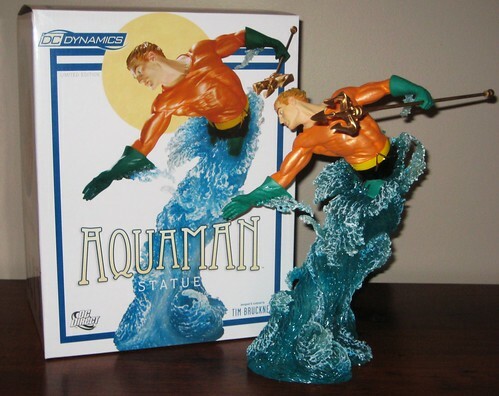 The recent Heroes of the DC Universe Aquaman Mini- Bust had a trident that was the same as what often comes with a 6" figure, but the DC Dynamics Statue gets an upgraded version. It's still flexible, but has wider and more detailed edges and prongs. While the statue looks great from a number of angles, the length of the trident does limit the options in my display. The only downside to this excellent statue is the cost. While the price point is on par with a full sized Bowen Statue, in DC Direct terms I think these are a bit pricey. A full sized 10 - 11" Cover Girls of the DCU Statue runs at nearly half the price of this, and a massive two-character statue like the recent Batman vs. Killer Croc is the same price as the DC Dynamics, so it's a bit hard to reconcile what could basically be a well-done mini-bust on a really fancy and tall base being priced where it is, As such, the value for money will probably keep me from picking up any of the others in the series, although the Green Lantern and Batman pieces definitely appeal visually, and I love the Silver Aged Goodness of the Supergirl Statue. While this is likely to be my one and only full-priced DC Dynamics purchase (one never says never when it come to sales!) , it's certainly a vital part of my Aquaman collection, and I keep returning to my display to appreciate just how good looking it is. 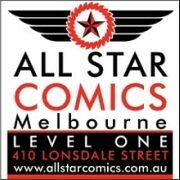 With Arthur's return at the end of BLACKEST NIGHT, it's a good time to be an Aquaman fan. Let's hope DC Direct keeps the Aquaman love coming! You can see more pics at Facebook, discuss this at the AFB Forum, and comment on this post for a chance to win the April AFB Comment of the Month Contest! Lookit all that water! They certainly got the "dynamic" part of the title down pat. Like the water effects. The way the legs are done seems off to me. Might just be the angles. The head is tilted backwards than in the concept art but I agree that the dynamics are alright. I like the styling on this line, but I'm still not sold about the hiding of the legs. I'd rather a 'complete' statue as opposed to a bust with a base. Very nice looking statue. The face looks a bit . . . off, but the rest is outstanding. Since this is classic Aquaman, I miss the scales on the tunic. Sure, it makes him look like a goldfish, and would add quite a lot of busy detail to the sculpt, but the statue doesn't quite say aquaman without them. On the other hand, I really do like the dynamic pose! It looks pretty good. Probably not something I'll ever own, but if someone gave one to me I wouldn't say no. I'd love to see these in person before deciding, but the Aquaman and Supergirl ones really appeal to me also. oh it's beautiful! the colours, the way it flows (ha! ), the pose!